In 1909, thousands of young women, many just twelve years old, streamed from factories to strike. One young woman, Clara Lemlich, was their leader. 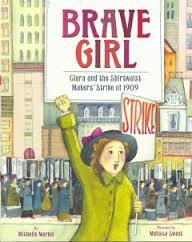 In Brave Girl, Clara and the Shirtwaist Makers’ Strike of 1909 Michelle Markel celebrates how Clara stood up for what she believed was right and set in motion a strike that would make conditions better for garment workers in NYC and throughout the United States. This book tells the true story of Clara Lemlich, a Jewish immigrant who came to America to flee persecution in Eastern Europe. After moving with her family into the tenements in NYC, no one will hire Clara’s father. They will, however, hire Clara. Like thousand of other immigrant girls, Clara becomes a garment worker. They earn a few dollars a month, but it helps pay for food and rent. So instead of carrying books to school, many girls carry sewing machines to work. This was not the America Clara had imagined. Fed up with the horrible working conditions (Has everyone read Lyddie by Katherine Paterson, Uprising by Margaret Peterson Haddix, or Bobbin Girl by Emily Arnold McCully?) Clara begins speaking out, urging her fellow workers to team up and join a union. When she spoke out against the factory owners, Clara was beaten, arrested seventeen times, and had six ribs broken, but they can’t break her spirit. Maine artist, Melissa Sweet, uses watercolor, gouache, and mixed media to create the paintings used in this book. Sweet frames each illustration to give the impression we are looking through a scrapbook, seeing snapshots of Clara’s life. They capture Clara’s determination and reflect the spirit of the thousands of women who stuck together to make their lives a bit better. There is one quite stunning illustration that allows us to look down on rows and rows of young women bent over their sewing tables. It gives one the perspective of how cramped their working conditions were. The combination of text and illustrations work together to make Brave Girl a must read for those in grades 5 and up. An author’s note give more back story about the garment industry, and the bibliography lists general and primary sources. Brave Girl is a very powerful story. When addressing older students, use it to explain the benefits of Unions, the horrors of sweatshops in other countries, and how they -- the students -- can make a difference. To see selected pages from this book, go here. For more books celebrating Women's History Month, go to Kidlit. To learn more about women leadership, go here.